Jubilo Iwata Stadium Changes Its Name to Yamaha Stadium (Iwata) Yamaha Motor selects "Jubilo" as its rugby team name - News Releases | Yamaha Motor Co., Ltd.
After consultation with Yamaha Football Club Co., Ltd. (President: Takanori Matsuzaki), Yamaha Motor Co., Ltd. has decided to change the name of its stadium from Jubilo Iwata Stadium to Yamaha Stadium (Iwata) as of July 1, 2003, and to name its rugby team Jubilo beginning this season. Yamaha Motor's stadium in Iwata, Shizuoka Prefecture was built in 1978 as the home ground of the Company's soccer team. Later, it was renovated to meet J League -- Japan's professional soccer league -- standards. 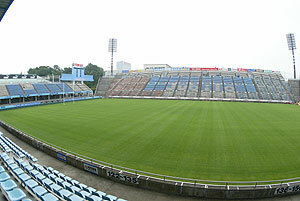 In 1994, the stadium was named Jubilo Iwata Stadium. Most J League home stadiums are under public management. Yamaha Motor's Jubilo Iwata Stadium is one of the few soccer stadiums owned by a private company. It accommodates about 17,000 spectators, and is equipped with an Aurora Vision display system. Originally designed exclusively for soccer games, this sophisticated stadium offers up-close views of the pitch from throughout the spectator stands. Yamaha Motor's rugby team was named an elite level corporate sports team in 1987 by Japan Rugby Football Union. Last season, the team was the champion in the Kansai A League, for top club teams throughout the Kansai region. This year, it will be in the new Super 12-style "Japan Rugby Top League" competition for the nation's best clubs. In order to host the Top League games, which begin in September, Yamaha Stadium (Iwata) was partially renovated, with the newly upgraded facility now ready for top-level rugby in addition to soccer. True to its corporate mission of "touching people's hearts," Yamaha Motor has always fostered a spirit of "challenge". It was in pursuit of this thrill, excitement and accomplishment of sport that the Company established its soccer team in 1972 and rugby team in 1984. Following the recent decisions on the club name and the stadium, the rugby team opted for the saxe blue uniforms already familiar to local supporters of the soccer team. Like the uniforms, Yamaha Stadium (Iwata) will also be unified, serving as a venue for J-League soccer games as well as Top League rugby games.Yamaha Motor continues to promote its long-term vision of sporting fun and excitement, in this case through rugby and soccer.